I made this tart for a couple of friends and it was a HUGE SUCCES! So if you don't have a lot of time, but would like to bake something really delicious and fabulous looking, this tart is for you. I will definitly repeat it again. 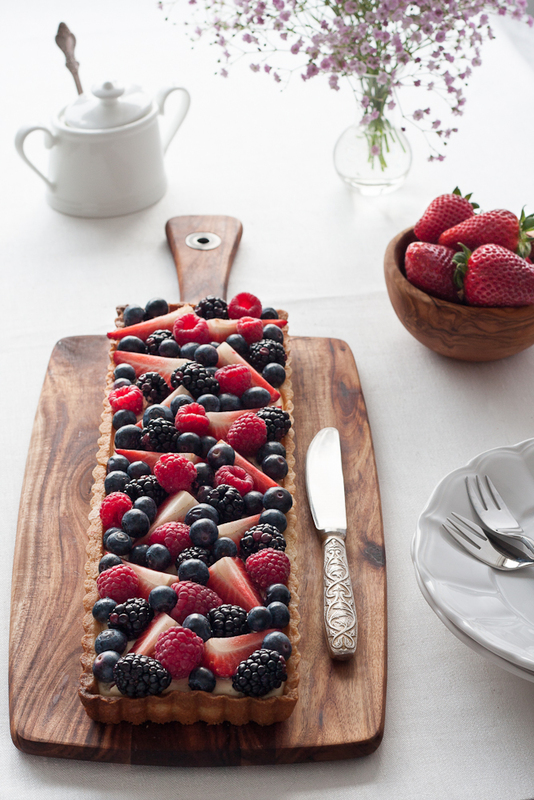 Crispy crust, rich cream and berries combine in a treat that's twice as delectable as the sum of its parts! You should try it, trust me. 1. Combine sugar, salt and butter in a big bowl. Using the tip of a knife, scrape out the seeds from the vanilla pod and aad them to the bowl.With your fingertips, mix and cream everything nicely, then add the egg yolks and work them delicately with your fingertips. 1. You will need a tart tin with removable bottom: 35x11 cm, 2.5 cm deep. Lightly butter it and chill on a baking tray. 2. Roll out the pastry (pate sablee) to a rectangle, 3-4mm thick. Drape it over the rolling pin and unfurl over the tart tin. 4. Preheat the oven to 180 C (350 F). Pierce the chilled pastry all over with fork. Line it with baking paper, fill with beans or peas (it will prevent the dough from rising or "sliding". 1. Soak the gelatin in cold water to cover for 5 minutes. 3. Warm up 2 tbsp of cream in a small pan to about 50C. Drain the gelatin, squeeze out excess water and add to the cream, stirring to dissolve. Pour into the mascarpone mixture, folding it in with a rubber spatula until evenly combined. 5. Spread the cream in the crust. Cover and chill at least 1 hours. 2. Pass the jam through a fine strainer. If it's too thick, add a few tbsp of water.Warm up the mixture in a small pan to about 50C. Drain the gelatin, squeeze out excess water and add to the jam, stirring to dissolve. 3. Cut the strawberries in quarters. 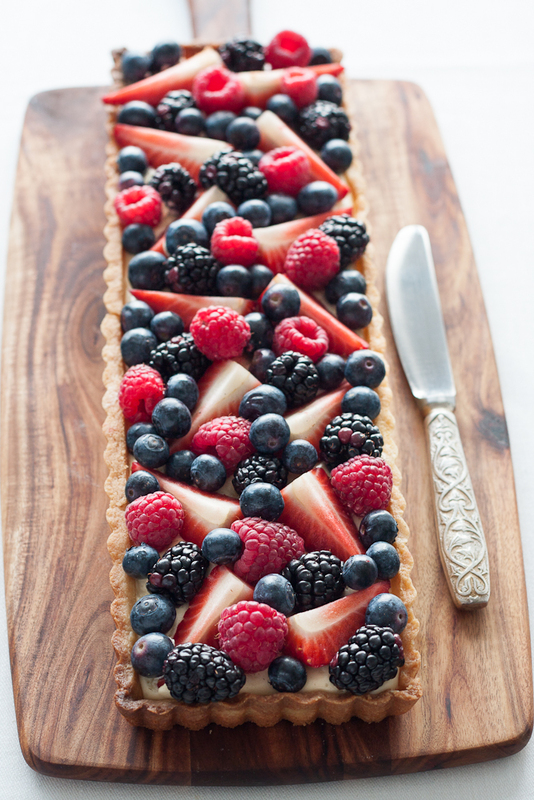 Arrange all berries on top. Cover berries with prepared jam. 4. Refrigerate until ready to serve (1-2 hours).